Alright, so we had "Bun in the Oven" cookies for my sister Molly's baby shower favors, but what for the dessert table? So, I went with pickles and ice cream cookies! 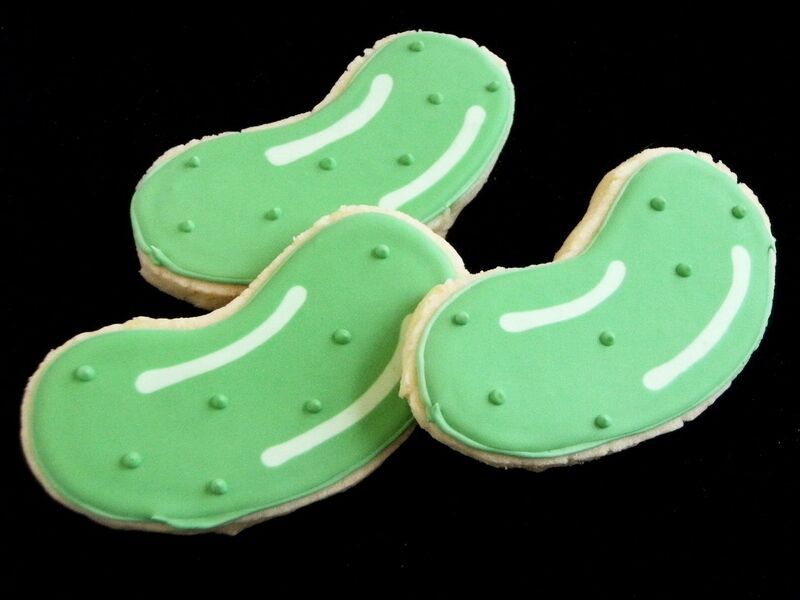 I was nervous about pickles....I mean, how cute can pickle cookies be, really. But, you know what, I actually loved them! My lovely assistant (read: husband) made another template for the pickle shape. See how the edges are a little rougher than if I had used a cookie cutter? I'll let you in on a little secret....I CANNOT pipe straight and even criss-cross lines. Oh, believe me when I tell you, these pictures are of the BEST cones! You've been warned...if you purchase these through the shop, your cones will have lines that are, um, "whimsical." Happy Baby, Molly! I can't wait to find out if we will have a new little niece or nephew!!! I LOVE the pickles!!! SOOOO cute! Given that I can't pipe AT ALL, those lines are pretty darn straight! And the pickles are adorable! oh my GOODNESS.. those are ADORABLE! BTW, the mustache cookies are safely tucked into the freezer (ie. so I can resist them they smell so incredible) for Thanksgiving! Soon, very, very soon....come to Momma little mustache cookies. They absolutely could not be any cuter! Love them!! They look wonderful, Great job! Adorable!! Both the pickles and the ice cream cones look awesome! Adorable!!! The ice cream cones and the pickles are so cute!! Both the ice cream and the pickles are darling! Pickles and Ice cream, so awesome! Those cookies are just great!!! These are too cute! Where do you get your cutters? Do you hand cut a lot with patterns? Sarah...I do every once in a while, usually when I think of a design at the last minute and there's not enough time to order :), or if I can't find the cutter I need or it's the wrong size. Bridgett-only you could make a pickle pretty! I can't wait to hear about Molly's babe-let me know so I can shop! I love the pickles and ice cream! Such a cute idea. I craved things I hadn't had since I was a kid - orange soda, gummi bears, mac & cheese made with the orange powder, etc. And Quarter Pounders with cheese. Still eat those! Those are so cute!! I just love the pickles!!! I craved custard filled donuts. I could eat 3 at a time! Now on the rare occasion that I actually have a custard donut, I can only eat one. Well that's just about the cutest combo EVER! Can't believe what perfect pickles those are! You are amazing and I am so happy to be inspired by you! These are adorable! I l-o-v-e the pickles! 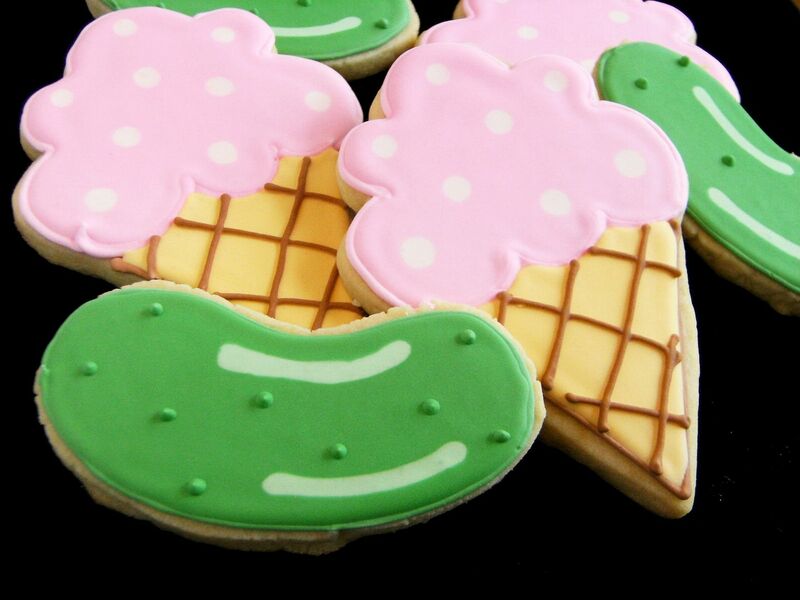 Love the pickles and ice cream cookies... so cute!! Love those cookies so cute! I craved ice when I was pregnant. I want to add your link to my Healthy Mom, Healthy Baby website. Is that okay? Do you have an official website where people can order cookies? I craved black olives with pasta during my first pregnancy, Baskin Robbins Chocolate Chip ice cream with my second! Found your Etsy shop --- how cool! i'm dying over the pickles!!! You are crazy--the "whimsical" cones could NOT BE CUTER!!! Love them and the cute pickles! This Christmas I am going to attempt to follow your instructions for fabulous cookies. I just ordered my vanilla bean paste from amazon, so I can start practicing. As usual, your work is adorable, your ideas creative and your blog is great! These were adorable! I loved the cones and the pickles! I crave Ruebens and green tea like nobody's business in between the morning sickness. oh my gosh Bridget those are AMAZING! how totally cute!! I LOVE those pickles, oh my gosh! How CUTE!! That is the cutest idea ever! Those pickles really turned out great. I might have to try that sometime! Wonderful job Bridget. Absolutely wonderful. I might actually have a hard time biting into the pickle cookies and tasting sweet cookie instead of sour pickle. :) Pickle juice cookies, anyone? I mean, they make pickle juice snocones, right? PS... you know I'm totally kidding about the pickle juice cookies, right? Right? Oh and with my first, the only thing I could stomach was a meatball sub from a little place downstairs from my office. I think I ate one of those a day (and sometimes nothing else) for several weeks during 1st trimester. They turned our fantastic and tasted yummy too! I craved Chick-fil-a sandwhiches when I was pregnant with Ike. I could have eaten them all day. 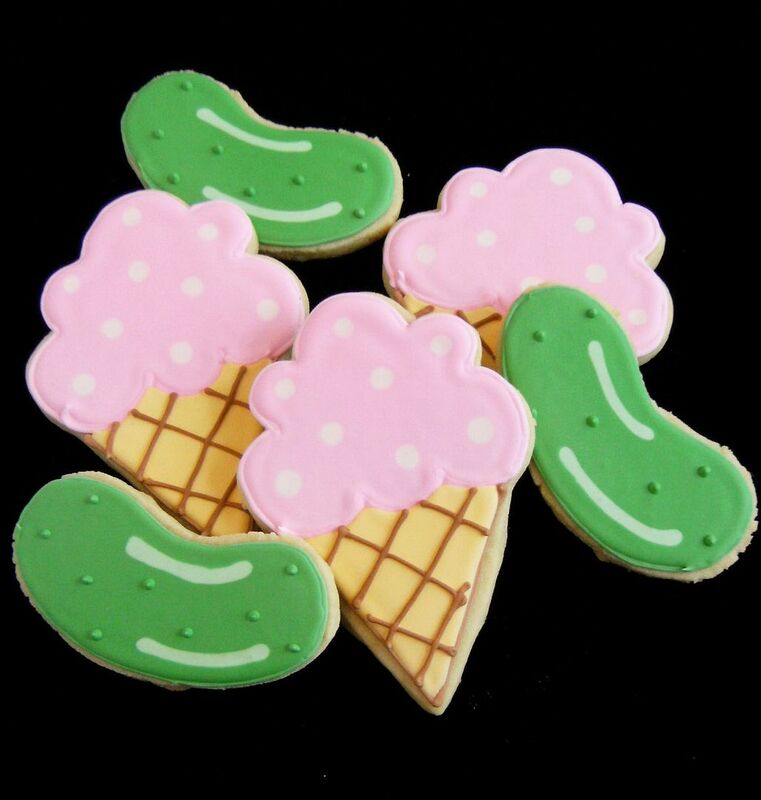 Pickles and ice cream cookies - such a cute idea, and they are just *cute* overall. I never thought a pickle could be cute! ;) Very impressive! I think the pickles are adorable!! And when I was pregnant, I craved milk!!! Those are about the best cookies I have other seen, followed closely by the bun in the oven cookies. With my first baby, I also craved McDonald cheeseburgers! Could not get enough of them. This time around... nothing. I only have dislikes this time -- like coffee. BLECH. I craved sandwiches...either the der weinersnitzel ruben sandwich or a homemade tuna with pineapple and cheese melted on top. Needless to say I gained 13 pounds my 5th month with my first pregnancy. Those are darling!! Now I want someone I know to have a baby.. you know, just as an excuse to make something that cute! Oh Bridget..I love thepickles!!! So darn cute!! I know a thing or two about straight lines and I agree totally whimsical. Just adorable!! My Mom used to go to a pregnancy shop called Pickles and Ice Cream~ I remember shopping for things when Tara was a bun :) Your cookies are Adorable as always! Those are the CUTEST cookies, I love them! And, I love whimsical. I have never seen pickles & ice cream look so adorable! Nice job! I love these cookies! They are beautiful!Wish I had them when I was pregnant, but my baby is 3 1/2 months old already! I might have to use them for our German pickle tradition too! I craved fruit, lots of fruit and donuts when I was pregnant!!! 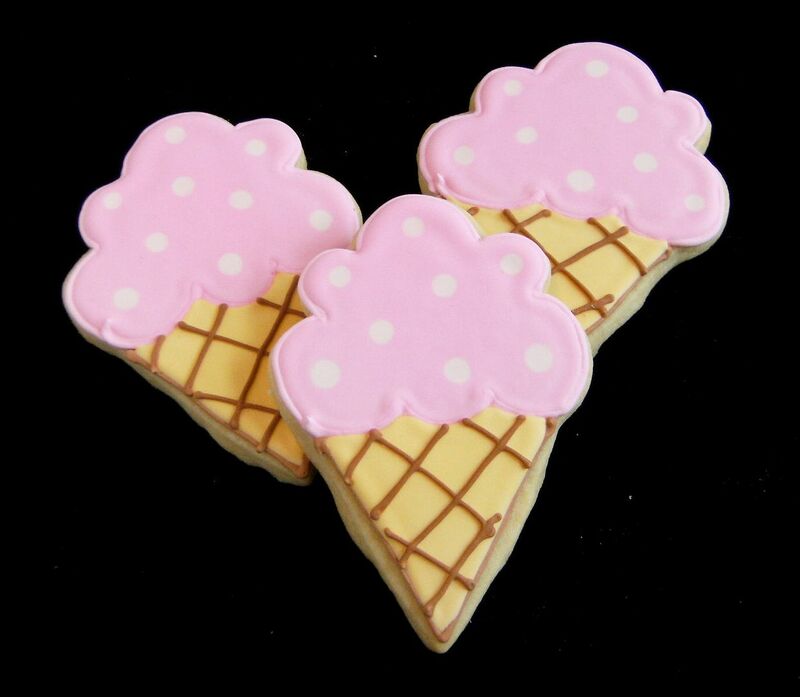 Adorable cookies and so perfect for a baby shower! Love the name of your blog! Keep them any way, they're whimsical? Best husband-of-cookie-baker line ever!! Awwwww! I think my icing melted a little on that one! Absolutely precious!!! The pickles are the best! These cookies are terribly cute. Love them! I love your pickle and ice cream cookies. When can I purchase them from you and how. I don't think I've EVER commented on any Blog before, but I just had to tell you how stinkin' cute your blog is! I love it! I've got to share it on my blog and on my facebook! Your blog makes me sad that I don't have more time to write on my blog! Your cookies are adorable, kudos! Love the pickles and ice cream!! Your cookies are awesome! Many years later, and I finally stumbled upon your pickles and ice cream cookies. They are really cute. I had to laugh when I saw them because I recently wrote a book called Pickles, Pickles, I Like Pickles, and the character at the end says he will have pickles for his ice cream... "well, maybe I won't eat them with my ice cream." Every time I read that part to kids, they always say "eewww".